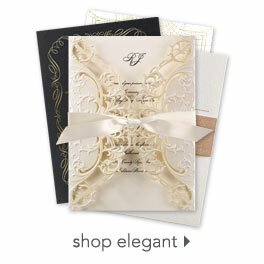 A splash of metallic foil brings a gallery-worthy element of design to these modern wedding invitations. Frame and center box are printed in your choice of colors and you get to choose from three different foil colors to create a truly custom look. The back of this invitation features a solid colored background in your choice of color and plenty of room for more wording.